-- Select a Size -- X-Small Small - Out of Stock! Medium - Out of Stock! 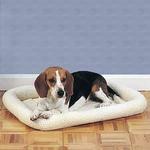 Give your pet a restful experience with the supportive Slumber Pet Sherpa Crate Bed in Beige. Unique bumper style crate mat combines thick sherpa and bumper-style cushioning. Bed dimensions are slightly larger than ProSelect® Crate dimensions so the bumpers are supported by the crate, softening the crate’s edges and providing an inviting nestling area for dogs. High-quality sherpa stays cool in the summer, holds heat in the winter, and is completely machine washable. Rolls up for traveling. 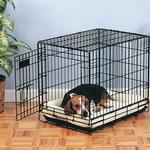 Slumber Pet™ Fleece Beds fit most brands of dog crates, carriers, and houses— or use alone without a crate. Machine wash and dry, low temperatures on both. Slumber Pet Sherpa Crate Bed - Beige Customer Photos - Send us your photo! Kai: "I don't do mornings" in his sherpa bed and folding crate. Posted On 11/25/15 by Katie from Fredericksburg, VA Yes, Katie recommends this product! We have several of these beds for many years. They fit perfectly in the different sizes of the extra large, large and medium size airplane plastic crate/kennels that we have. They are soft and the dogs really like them. Since we leave the door open to their plastic kennels for a private place for them to nap anytime the beds are used daily. I have washed them on the hottest washer setting and dryer many times and they come out great and still seem to be the same size as before washing. The bottoms are not thick and not much padding but we found that to be good in case the dog needs more head room in the kennel or we add blankets underneath the bed for more padding for an older dog. But in the summer the thinner bottom is cooler for them since our kennels are in the living room. Also the beds don't slide around the kennel but stay in place really well. The dogs really like them too! Highly recommend! Posted On 04/05/15 by Denise B from , SC Yes, Denise B recommends this product! These are well made, softer than any I have previously purchased and the babies seem to like them. Haven't had to laundry yet, so hopefully that will go well. Posted On 11/07/13 by Brooke B E from Greensboro, GA Yes, Brooke B E recommends this product! These are great as beds by themselves, but fantastic to fit in the crate. Easy to wash and dry in machines.